Spain midfielder Andres Iniesta has signed for Vissel Kobe, the Japanese club have announced. 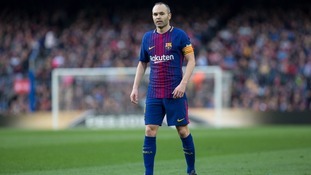 Spain midfielder Andres Iniesta has signed for Japanese side Vissel Kobe after bringing the curtain down on his brilliant Barcelona career. The 34-year-old playmaker left the Catalan giants after landing his ninth LaLiga title with the club. He also secured a host of other honours, including four Champions League triumphs. A World Cup winner with Spain in 2010, Iniesta captained Barcelona during his final three seasons at the club. Vissel Kobe, coached by Takayuki Yoshida, sit sixth in the Japanese top flight after 15 games of their season, already 15 points behind runaway leaders Sanfrecce Hiroshima. Andres Iniesta praised the club and fans as he bid an emotional farewell to Barcelona after 22 years at the Nou Camp. LaLiga champions Barca claimed a 1-0 win over Real Sociedad and it was a fitting finale for the 34-year-old, who lifted the trophy for a ninth time. 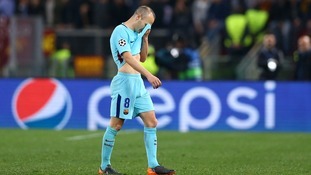 Addressing supporters on the pitch after the final whistle, Iniesta said he "leaves as a man", having spent so long playing for the Catalan giants. "I will move on and carry you all in my heart forever," he said in quotes published on Marca. "It's been a wonderful 22 years, full of pride, and it's been a pleasure to represent this club. "I thank you for all the love and respect that you've given me since I arrived as a child, I now leave as a man." Barcelona boss Ernesto Valverde felt it was only right to give the midfielder the send-off he deserved by replacing him late in the game with Paco Alcacer. "We wanted to compete and win, but today was Andres' day and the crowd made it special," Valverde told Barca TV. "I wanted to change things at the end of the game, to coincide with Leo (Messi) on the field. It was the right moment. "These types of players will be talked about long into the future. "They are unrepeatable, historical players that everyone will remember." Andres Iniesta has announced he will leave Barcelona at the end of the season. The Spain international, 33, came through the youth system with the club and turned professional in 2001. He has enjoyed a glittering career for club and country, and said today: "This is my last season here." Iniesta's emotional press conference was witnessed by a number of members of the Barca first team. He has won eight LaLiga titles with the club and four Champions Leagues, and scored the only goal as Spain beat Holland to win the 2010 World Cup in South Africa. "I want to thank my team-mates," he said. Iniesta has been linked with a move to the Chinese Super League when his time at Barcelona ends. Guardiola wants to be reunited with Barcelona's Iniesta at Man City and all the other transfer rumours from around the leagues. Andres Iniesta has admitted his 'hurt' at Barcelona's Champions League exit at the hands of Roma knowing full well it could be his last. Clubs could be put on alert after Iniesta admitted he is still undecided whether he will leave Barcelona at the end of the season. Barcelona playmaker Andres Iniesta says he is contemplating a move to China at the end of the season. The 33-year-old has spent his entire career at Barca, but admitted a switch is a possibility after returning from a hamstring injury in Wednesday night's 3-0 win over Chelsea at the Nou Camp. "Before April 30 I have to make the decision whether I'm still in Barcelona or I'm going to China, I have to assess what is best for me and for the club," Iniesta said. Iniesta has a "lifetime contract" with Barca as a reward for his years of exceptional service. Barca are in the Champions League quarter-finals for a record-extending 11th successive season after a 4-1 aggregate win over Chelsea. Iniesta has won the Champions League four times and is poised to win a ninth LaLiga title this season. He won the World Cup with Spain in 2010 and the European Championship in 2008 and 2012.